European stocks showed signs of resilience Monday following terror attacks in Paris that killed at least 129 people and wounded 352 more. France's benchmark CAC 40 opened 1% lower, mirroring losses elsewhere in Europe, before reversing to trade slightly higher by late afternoon. The euro weakened by less than half a percentage point against the dollar. France's stock exchange, Euronext Paris, was operating under heightened security. While the broader French market was little changed, airline and tourism stocks took a beating. KLM-Air France (AFLYY) and hotel group Accor (ACCYY) fell more than 5%. Other regional travel stocks also took a hit. Beyond Europe, Virgin Australia lost 6.5%, Taiwan's Eva Airways dropped 5.4% and Cathay Pacific shed 2.4%. Kit Juckes, a strategist at French bank Societe Generale, said he was "struck that the reaction to such atrocities has changed a lot" since September, 2001. "Then, we stood and stared, in shock," he said. "But we've moved on." French fighter jets bombed a series of ISIS sites in Syria on Sunday in retaliation for the terror attacks in Paris. Despite the prospect of further military action in the region, crude prices increased only slightly to $41 a barrel. 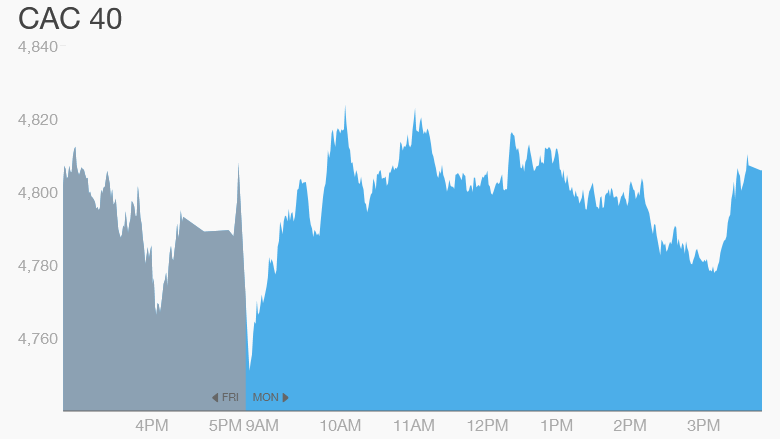 After suffering steep declines during Sunday trading, markets in the Middle East bounced back on Monday. Saudi Arabia's Tadawul index and Dubai's DFM posted mild gains in early trading. Most markets in Asia closer lower, led by declines of 1.7% in Hong Kong and 1.6% Seoul. Japan's Nikkei and Australia's ASX All Ordinaries lost about 1%. The weak performance for stocks in Japan on Monday was fueled, at least in part, by data showing that the country has slipped back into recession. Still, Japan's central bank is unlikely to announce more stimulus at the end of a policy meeting this week, Marcel Thieliant of Capital Economics wrote in a research note. Any such announcement isn't expected until early next year, he said.